On Saturday, however, I needed a good pick me up and I could think of nothing better than melted cheese. We had a variety of cheeses in the fridge, mostly Greek, but they seemed too healthy to satisfy my naughty cheese cravings. But the box of camembert was waving at me from the back of the fridge and I just had to take the call. Very few food things can feel like a warm blanket and in my opinion melted cheese is definitely one of them. So, I decided to try a great classic and bake the cheese in the box. We would be enjoying it with potato wedges to make it even more of a comfort meal, but bread will do just fine. Needless to say it was a great lunch. Not the healthiest of choices, but still better than a take out pizza! 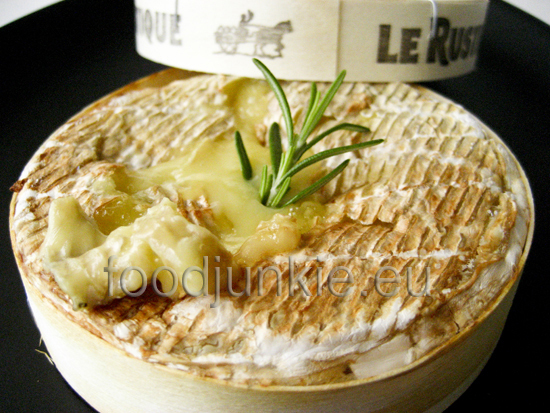 I generally like Le Rustique a lot, as it is very smelly, but if you are not a fan of strong cheese you can choose a milder camembert like President. Of course there are many artisan cheeses you could use, but these are the two brands I can get at the Greek supermarket. I would make this dish again for friends as it makes people get involved, dipping their wedges in the melted cheese and fighting over the food. Plus it is so very easy to prepare and looks impressive. What else do you want? Το σαββατοκύριακο όλοι βιώσαμε πολύ κακό καιρό, που σχεδόν τον έχουμε ξεχάσιε βέβαια με τέτοια καλοκαιρία που έχει τώρα! Για να μου φτιάξει η διάθεση έκανα κέφι κάτι σε λιωμένο τυρί. Δεν ξέρω για σας, αλλά λίγα φαγητά έχουν την αίσθηση μιας μαλακιάς, ζεστής κουβέρτας, και το λιωμένο τυρί είναι σίγουρα ένα απο αυτά! Στο ψυγείο είχαμε διάφορα τυριά, κυρίως ελληνικά, που ήταν πολύ υγιεινά. Η μύτη μου όμως δεν γελάστηκε από τη χαρακτηριστική εσάνς που άφηνε πίσω του το κουτάκι με το καμαμπέρ και θεώρησα πως τα 60% λιπαρά θα ήταν τέλεια για το σκοπό μου. Γενικά μου αρέσει το Le Rustique γιατί είναι βρωμερό, αλλά αν θέλετε κάτι πιο απαλό στη γεύση προτιμήστε το President. Εννοείται πως υπάρχουν πολλά κακαμπέρ που θα πορούσαν να γίνουν με αυτόν το τρόπο, αλλά αυτές οι δύο μάρκες είναι ακι οι πιο συνηθισμένες στα ελληνικά σουπερμάρκετ. Απλά βάλτε το καλού κακού και σε ένα τάπερ γιατί το ψυγείο σας θα μυρίζει κάπως…ιδιαίτερα. Δεν μπορώ να σας περιγράψω με λόγια πόσο ωραίο είναι αυτό το πανεύκολο ορεκτικό. Εμείς το φάγαμε για μεσημεριανό βουτώντας μέσα πατάτες φούρνου με τη φλούδα τους (εντάξει, όχι ότι πιο υγιεινό, αλλά καλύτερο από ντελίβερι), αλλά και λαχανικά ή ένα ωραίο φρέσκο ψωμάκι θα είναι ότι πρέπει. Νομίζω πως την επόμενη φορά θα το φτιάξω για φίλους, καθώς τέτοιου είδους πιάτα που θέλουν συμμετοχή και μπορεί να δημιουργήσουν και έριδες στο τραπέζι έχουν πλάκα 🙂 . Pre heat the oven to 200 oC. Place the cheese back in the box. Rub the surface of the camembert with the garlic and prick it all over with a skewer. Take some leaves off the thyme or rosemary and push them into the holes you made. Sprinkle a bit of wine over the surface and place the box on a baking tray. Bake the cheese for about 20 minutes until lightly golden on top and bubbly. Serve immediately with potato wedges or a fresh loaf of baguette. Προθερμαίνουμε το φούρνο στους 200 oC. Βγάζουμε το τυρί από το κουτί και πετάμε το πλαστικό του κάλυμμα. Στρώνουμε στη βάση του κουτιού αντικολλητικό χαρτί (κομμένο στο ίδιο μέγεδος) και επανατοποθετούμε το τυρί στο κουτί. Αλείφουμε την επιφάνεια του τυριού με το σκόρδο και τρυπάμε σε αρκετά μέρη με μια οδοντογλυφίδα. Κόβουμε φυλλαράκια θυμάρι ή δενδρολίβανο και τα χώνουμε στις τρύπες. Ραντίζουμε με λίγο λευκό κρασί και τοποθετούμε το κουτί σε μια λαμαρίνα ή ρηχό ταψί. Ψήνουμε το τυράκι μας για περίπου 20 λεπτά ή μέχρι να ροδίσει και να λιώσει εσωτερικά. Σερβίρουμε αμέσως με πατάτες ή μια φρέσκια μπαγκέτα! Ooo, how good does this look! I love Lerustique as well and it is quite easy to find here. Ofcourse because it does tend to smell rather strong, Tom always complains when I buy a little box of this cheese… 🙂 He’ll just have to live with it! In fact; I am thinking I might be buying some tomorrow as I have a friend come over and it will be perfect for a snack with some bread…! Ai… what a pity… I’m not fond of any cheese 😦 , but there’s something in the pictures that attracts me a lot! I wish I liked them!!!! Ooooh, I love Brie en croute and this I am sure is right up there. It sounds so good … but my husband isn’t a fan of “smelly” cheeses and I don’t think I can (or should) eat this all by myself. 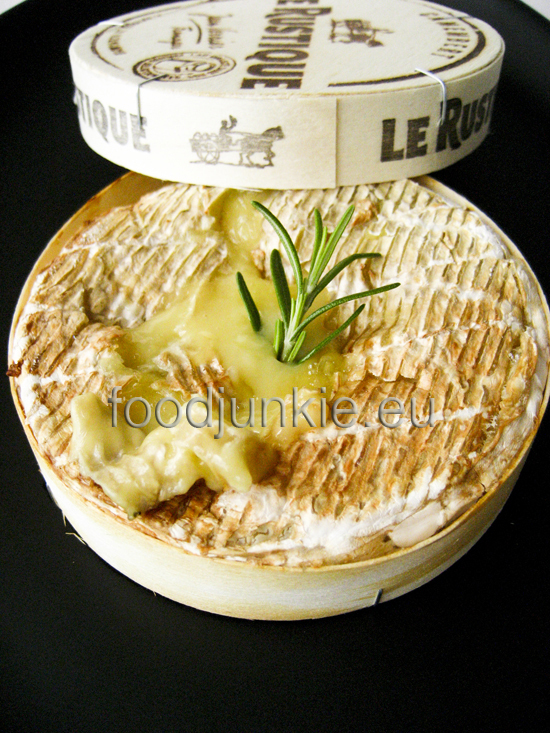 Maybe I will make it for our next dinner party in lieu of the brie I often bring out. You are so right – just wonderful but evil! Last time I baked a camembert I dipped steamed vegetables in it and tried to pretend it was healthy. alright, first, nuria doesn’t like cheese? and second, i have actually had to walk away from these wheels in the market b/c my family got into the habit of eating them just like this. it was too addictive. Thanks for dropping by my blog. That was useful info about natural food colorings. This cheese looks great although I am not a fan of “smelly” cheeses. My husband would finish this off by himself! i love cheese, and this looks like absolute decadence, especially when i know i will enjoy it all by myself at home! Such an easy recipe. Just great. I love the additional garlic and wine. Camembert en croute is one of my favourite memories from weekend getaways in Paris when I was a student in Amsterdam. You should also try it with fig marmalade or quince paste. It’s an unforgettable taste! Ioanna, this is one of my faves. I wrap a whole head of garlic in foil and bake it along side some Brie or Camembert. I make some bruschettas, smear the roasted garlic on the bread and then some gooey cheese. White grapes and a Riesling…yum!